A car is not only a means for transportation, but in many cases it is a work place, a meeting room and also status symbol. The best example of an automobile which best-manages and fulfills these needs is a limousine. 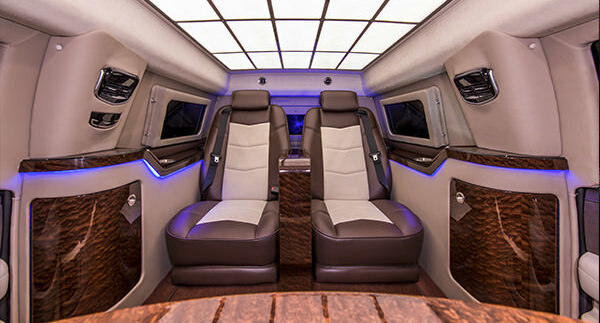 A limousine vehicle is quite unique in that its exterior dimensions are different from regular vehicles, its interior cabin features and functions which are unavailable elsewhere, and in general it can be modified to fulfill a multitude of purposes. 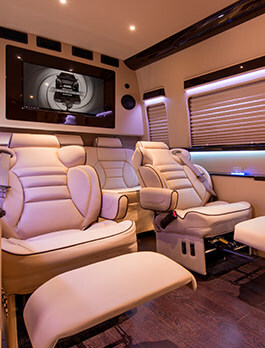 INKAS® Professional Vehicle Manufacturing specializes in the creation of executive limousines which are made for those who want to feel comfortable, those who wish for their vehicles interiors to have all they need and more, and lastly for those who wish to have their specific requirements met to a tee. The vehicle stretching process is naturally a complicated and time-intensive one, a wealth of knowledge and equipment is required to carry out a job which effectively stretches a vehicle without sacrificing the vehicles quality or reliability – INKAS® has mastered the craft. Hydraulic-powered LED TV located within the divider crevice between the driver’s and passenger’s compartments. Built-in computer with hidden sliding mechanism allowing for quick and easy access. Modified Eco-HVAC heating, cooling, and air purification system especially good for smokers. Interior can be designed with any theme or materials or match any style. Additional items such as personalized monograms.